This is a great way to keep up with the Club and all of their upcoming activities. Watch your mail for the next issue. You can also read the most current issue of our newsletter online by clicking here. Our friends couldn't stop raving about the wonderful trips they went on with the Select 50 Club, so we decided to join - and we are so glad we did! 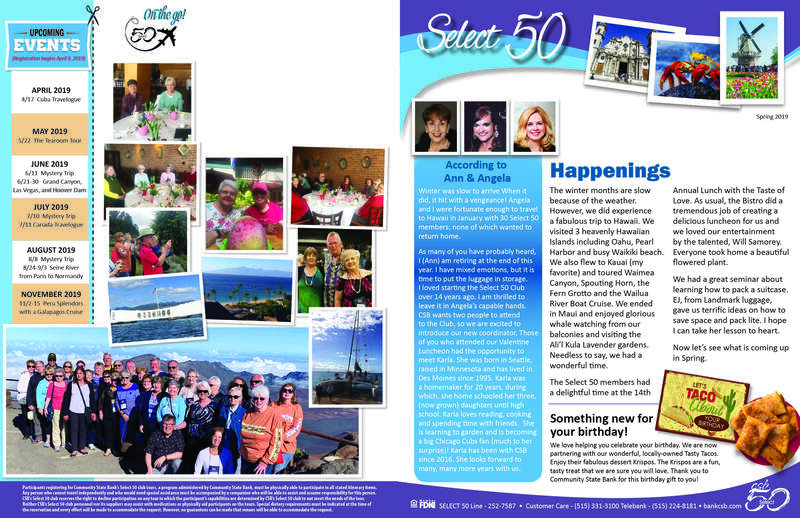 The Select 50 Club has introduced us to so many new friends and places. The Club has so much to offer: adventurous trips around the world, monthly Mystery Trips, exciting travelogues, lifestyle classes, and special benefits. Angela and Ann are so welcoming, and the memories we have made will last a lifetime. Love it, love it, love it!